Franck Bohbot is an award winning French-born photographer who lives in New York City. I was just introduced to his work by a high school friend, and noticed a page that simply screamed CURBSIDE CLASSIC! Absofrigginglutely fantastic. Thanks for pointing this out, Richard. Thank you, Richard. This has made a sunny day even more cheerful. I’m a professional photographer. These demonstrate no talent whatsoever apart from an ability to focus and take a correct exposure. These are nothing more than snapshots; flat, two dimensional, insipid and uninspiring ones at that. Well composed, modulated tones, spontaneous, uninstagrammed, reminiscent of some of the colour work of Harry Callahan in the 70s. I’m a professional art director and I think you’re off the mark. The relationship between the beaters and the backgrounds is sort of peak CC. Technique is a secondary consideration when confronted with striking imagery. Harry Callahan? Go ahead; make my day. Beauty is in the eye of the beholder. 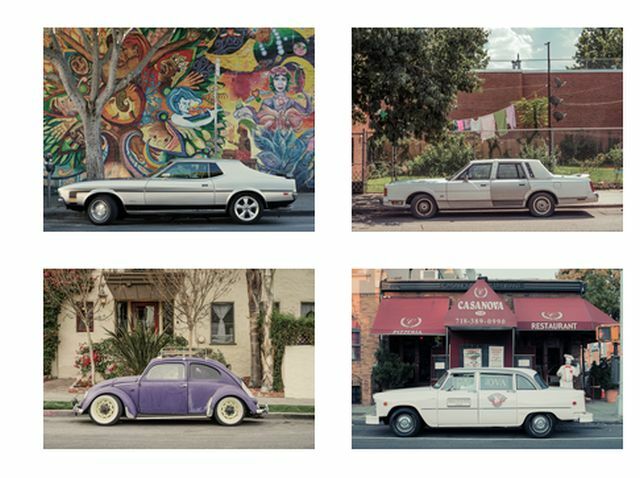 I think the beauty of these pictures is that the cars, taken in context with their surroundings, tell a story. I have to agree with Don-I’m not a photographer, but to my eye these pictures are carefully framed against their distinctive backgrounds and focused in such a way that the viewer can easily perceive the details that identify make, model, features, history and modifications . From a writer’s perspective, you can look at each one and immediately begin to construct a story, or imagine why they are parked where they are and who the owner might be. Dibs on the Falcon wagon! I’d be very proud to have my name on them. They are all excellent CC shots, and what separates them from the best of mine is a better camera and technique, among other things. A $100 point and shoot Lumix just doesn’t cut it, especially when the light starts to get low. Never mind that I haven’t properly gotten out of the snap-shot frame of mind. One of my biggest regrets is not taking some photography courses and really working on technique. These are very good shots; all of them. wow, great stuff. i looked at the rest of his portfolio, too. thanks for bringing it to our attention. I want to have coffee with the owner of the Beatle. What a great picture. I looked at it for 5 minutes imagining the stories that car could tell. Paul, you should reach out to this guy and get him to become a member!